The story of our church goes back to 28th January 1907 when five men (Messrs Alfred Ellis, Deveral, Lemming, Smith & Sumner) met to discuss the need for a church in Amersham-on-the- Hill to serve the many people who had moved into housing round the new station. They decided to hire the Bijou Hall in Station Road for Sundays and one evening a week for one year. On 17th February the first service took place at 6.30pm, the Hall having been provided with a reading desk, hymn board, hassocks and hymn books. They also established a weekly open meeting for prayer and Bible study. The women of the church raised money for an organ which was installed in October that year and the first morning service was held at 11.00am to celebrate this. On 29th April the next year, the first general meeting for the congregation was held and a Constitution, Basis and Rules were drawn up together with a membership role of 23 people. A Committee of Oversight was formed consisting of three of the originators (Messrs Ellis, Lemming & Sumner) and two others, Messrs Brudenell and Cole (Mr Deveral had died and Mr Smith moved away). The Rules stated that everybody was welcome to join regardless of denomination. As well as the Sunday services, other activities were quickly springing up. By July of that year an afternoon Sunday School was in existence and a magic lantern was purchased for monthly social meetings. Early in 1910 a monthly meeting of missionary interest was started too. 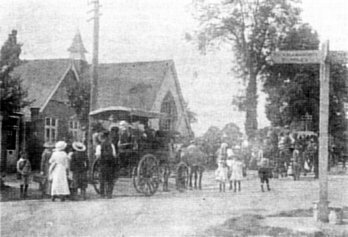 The congregation was starting to grow too large for the Hall and, at the end of 1910, a Building Fund was established. Shortly afterwards some land in Sycamore Road was bought and in April plans for the church were produced. There were arguments as to whether chairs or pews should be installed and it was only the Chairman's casting vote that made chairs the outcome - something that has stayed until today. The new church, known as the Free Church Hall, was opened in August 1911 and an organ was installed in May the next year. In December discussions took place about electing someone to take pastoral oversight of the church, but no decision was made. Lack of finance prevented any further investigations into this for a while. By 1912 a choir and the Thursday Evening Guild for young people were meeting regularly and in March the next year the Women's Own started.